Upon his recent visit to De Rustica Olive Estate, South Africa’s Food Evangelis, Francois Ferreira, our newly appointed brand ambassador got to soak in the beauty of the foothills of the Swartberg Mountain Range. He was also boldly introduced to the world of gold award winning extra virgin olive oil. Francois and Stephan visited our state of the art ALFA LAVAL press. As we are currently in production they could witness the complete process and gain insight into the production of extra virgin olive oil. 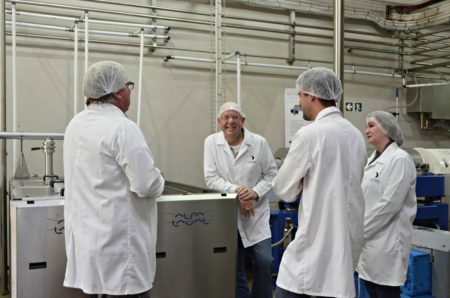 Our Food Safety System Certification 22000 ensured for the highest safety and quality standards while touring through the production press, led by our very own general manager, Joop Steenkamp. After visiting the press they got to escape into an environment that was as familiar with them as creating glamorous dishes in the kitchen daily. Tasting the actual product, joined by our Marketing Manager, Precilla Steenkamp. 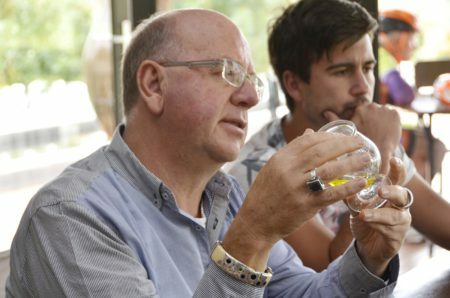 Tasting of extra virgin olive oil, like wine, is a sensory experience that all foodies should try. There is a wide range of flavours found in extra virgin olive oils. Flavours are determined by several factors including type of olives, ripeness of olives, growing conditions, and oil storage. The aromas of olive oil are a critical part of its flavour. In his own words Francois described one of the extra virgin olive oils in our new range as the following: The fruit is just like wow in there! The grass and then the fruit comes, it’s beautiful. Do you know what I’m already cooking in my head with this? Well, we suppose you can guess what happened next. Francois spoiled us with the best range of mixed herb salts and dukkah, pickles and chilli salsa’s. He paired this with different flavoured extra virgin olive oils in our range for a tasting experience that will linger in our minds for months to come. 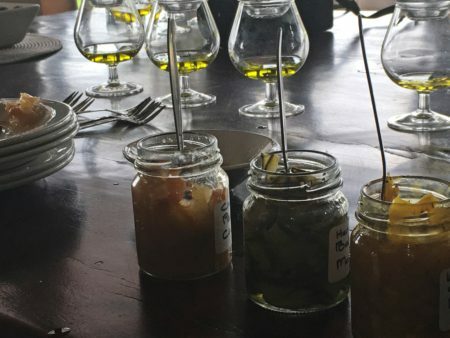 Without letting the cat out of the bag to much we urge you to keep an eye on our media platforms for upcoming recipes, projects and most of all the exciting venture between De Rustica Olive Estate and Francois Ferreira.